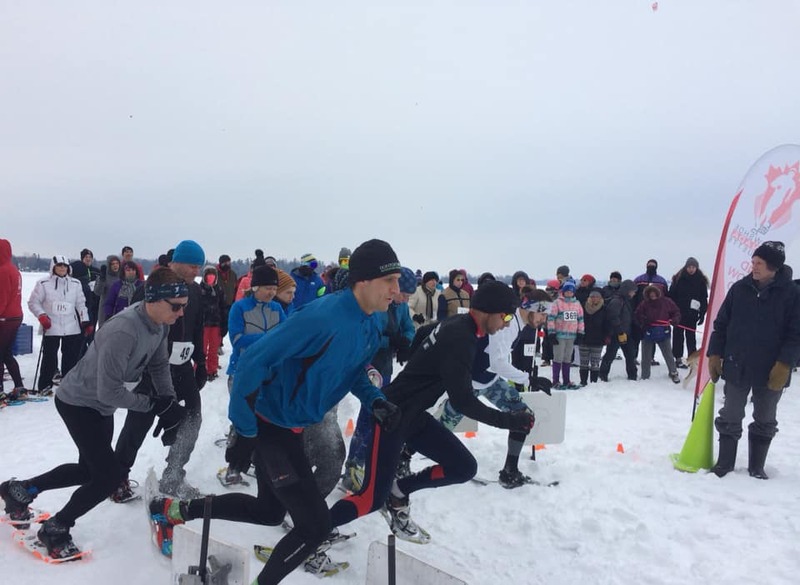 The Fenelon Falls Winter Festival 5K/10K snowshoe course was set to challenge the best in the province, providing vertical challenges unusual in snowshoe competition in Central Ontario, combined with single-track sections that challenged agility and speed. For the first time Sir Sanford Fleming College brought three Cross Country team members, including their Canadian 3K Obstacle Course Champion Andy Hein. The competition this year was won by Luca Senk of Collingwood with a time of 45:15:78 followed by Bernie Hogan of Bancroft in a time of 49:34:72. In the Women's race Kelly Doner of Collingwood winning with a time of 1:19:04, followed by a member of the Fenelon Falls Flyers running club Elizabeth McKinnon of Lindsay in a time of 1:40:14. 5K and 10K Snowshoe Racers traveled from Collingwood, Elliot Lake, Kingston, London, and Ottawa to compete in the Provincial Championships in Fenelon Falls. Interestingly, 90% of the 10K and 50% of the 5K athletes traveled from outside the City of Kawartha Lakes for the Snowshoe Canada “Ontario Cup Series” which is a new benchmark. Amazingly, the Women’s Super Master age category, composed mostly by Fenelon Falls and Bobcaygeon athletes was the most competitive field with 17 participants. Clearly the girls were out to “Kick It” and they did. Congratulations And a special Thank You to all of the volunteers who through their efforts made the Fenelon Falls Winter Festival a special day.